I’ve had a hankering for hot wings these days and it’s not even close to Super Bowl Sunday, the uber chicken wing event in America. At many of the hippest Asian restaurants these days, there is some version of chile-hot, savory-sweet chicken wings. From RockSugar PanAsian Kitchen in Los Angeles to Pok Pok in Portland, Oregon, to Momofuku in New York, Asian-style of chicken wings are on the appetizer menu. Naturally, I wanted to make my own. 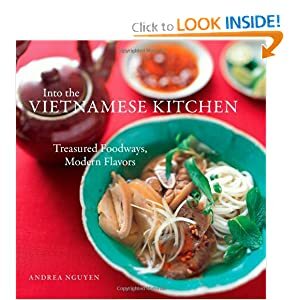 Admittedly, I’m partial to the renditions that involve Southeast Asian ingredients, fish sauce, garlic, and chiles. Can you blame me? It was hard to decide whose version was better as they were both addictive to eat. At RockSugar, my husband and I had minor squabble as to who should/would eat the last one. We also could figure out if this style of wings is Vietnamese or Thai or something else. Shed some light, if you happen to know. 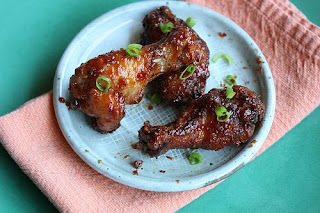 My solution is to make spicy Asian chicken wings at home. That way, you can have as many as you want. The hardest part of making the wings is to find the wings. They used to be at all the markets but I had to go to several places. Costco doesn’t have chicken wings anymore. I got mine at Whole Foods but there weren't tons. Chicken wings are also relatively expensive – between $3 and $5 per pound. When I asked a Whole Foods butcher why they’re pricey, he naively responded: “They weigh less than the legs and thighs.” I wasn't satisfied with that answer. When we talked a bit more about current chicken wing prices, we both realized that chicken wings are like skirt steak and duck legs. No one cared about them and they were considered down-market. But now, they’re prized for grilling and confit. Chicken wings used to be dirt cheap, considered nearly throwaway parts of the chicken. Amy Sherman (CookingwithAmy.com) remarked on Twitter that she used to rely on affordable chicken wings for her stock but that’s not the case anymore. So once you find your wings, the process to making an Asian-style hot wing is darn easy with the recipe below. It’s not much of a secret. Lots of fish sauce, sugar and garlic equal a winning combination. Then there’s the deep-frying, which yields the best crispy-chewy texture. It’s a relatively low-drama experience. Timid about frying? You can roast the wings (skip the rice flour coating) at 375F or 400F and then glaze them just as instructed in the step 6 of the chicken wing recipe below. I like to go all out and get the oil going. Why not? Chicken wings are now a deluxe snack. Do the full Monty, my friends and enjoy with a beer or glass of refreshing rose or white wine. Or maybe a cocktail. If you have a tweak or personal rendition of spicy chicken wings, do share it below. I used regular rice flour from Thailand. You can use the rice flour sold at regular health food stores, if you like. Cornstarch is okay too. 1. Split each chicken wing at the joint so that you have a drummette and a lower joint (the chicken’s forearm). Set aside. 2. In a small bowl, combine the garlic and water. Let sit for 5 minutes. Position a mesh strainer over a bowl, and pour the garlic water through to strain. Press on the solids to extract as much garlic water as possible. 3. Add the fish sauce, light brown sugar, sugar and pepper. Stir to dissolve. Transfer to a zip top bag, add the chicken wings, and refrigerate for 2 hours, or overnight. 4. Remove the chicken wings from the refrigerator at least 20 minutes before frying to remove some of the chill. Drain the chicken wings from the marinade and blot dry with paper towel. Reserve the marinade! Have the rice flour ready in a small bowl. 5. Pour the oil to a depth of 1 1/2 inches into a saucepan, wok, or deep skillet. Heat to about 360°F. Meanwhile, lightly dredge each wing in rice flour, patting off the excess. Put the reserved marinade and chile garlic sauce in a large skillet and set it on the stove. 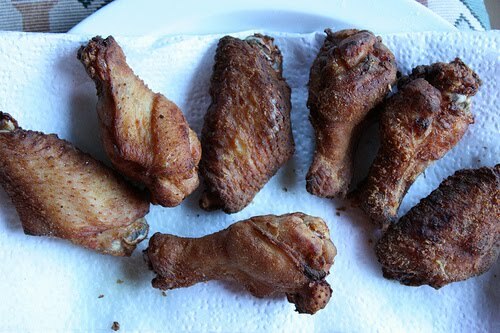 Fry the wings in batches until golden brown, 4 to 5 minutes. Drain on paper towel. 6. Heat the reserved marinade until bubbly and slightly syrupy. Add the freshly fried wings and stir, turn, and coat in the syrup, which will turn sticky as it reduces and clings to the wings. Add a splash of water if you want to dilute the glazy bits in the skillet and get them to coat the wings. There should be no liquid left when you’re done coating. Transfer to a plate, sprinkle with the scallion, and enjoy hot.